Like many other Apple-loving tech companies yesterday, Clearleft were huddled around MacRumours following its coverage of Steve Jobs’s keynote. And lo and behold we were presented with the iPhone. I don’t use that many features on my mobile: primarily I make calls, send texts and take photos. Occassionally I use it for browsing (football scores mostly) which until recently has been limited to WAP, although I now use a new – and increasingly ubiquitous – Sony Ericsson K800i, with Opera Mini. So what impressed me about the iPhone is that Apple has concentrated on precisely the features I use, with the addition of an iPod, and not really bothered to include much else, although I should mention the welcome introduction of wifi. Of course, Apple being Apple, they have concentrated on the interface big time. Based on the movies I can see myself actually enjoying using the phone, rather then the vague feeling of frustration I get from mobiles currently. The downside is that they will get grimly covered in fingerprints, and will have to be kept in bag to stop the screen getting scratched to pieces. Also it’s fairly big – half the thickness of my K800i, but significantly bigger otherwise which might be an issue as I normally carry my phone in my jeans. Unfortunately Jobs didn’t really talk much about the camera. Beyond the resolution – a relatively modest 2 megapixels – we have little indication of how good it is. Also it seem video calls (possible on some networks in the UK) will not be possible as it requires a second camera on the screen-side of the phone. As for the delivery date – probably June in the US and Christmas in Europe – that’s understandable and it’ll be interesting to see what deals Apple manages to make with network providers in the UK, especially as Cingular – Apple’s US partners – don’t operate here. Update. Brighton’s own mobile guru, Tom Hume, notes his thoughts on some of the practical aspects of the iPhone. Apple have also introduced Apple TV which I just don’t get: £199 just to play downloaded videos on your TV? If there was a recordable hard-drive in there I might be tempted, as I would if it included a digital TV decoder. 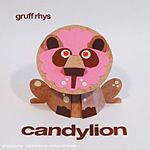 And talking of newly released goodness, the new solo album from Gruff Rhys, hirsute singer with Super Furry Animals, is as fabulous as you might expect. Filled with wonderful restraint, some really catchy tunes and plenty of Welsh, it’s a hit in the office. How to have disentangled headphones without resorting to buying a new iPhone.